This four-day tour showcases the best that Zhangjiajie has to offer, from the National Park to the Bailong Elevator to the Tujia Folk Customs Park to Tianmen Mountain National Park. Arrive at Zhangjiajie, China’s First National Forest Park. 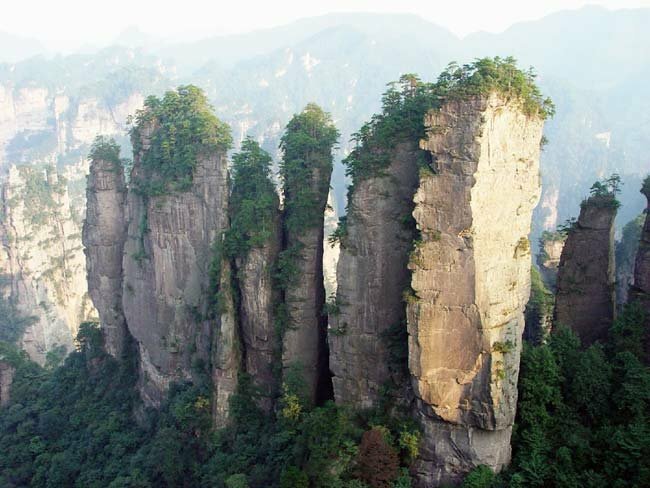 Zhangjiajie’s main tourist draw is the Wulingyuan Scenic Area, which was added to the UNESCO World Heritage list in 1992. This United Nations Educational, Scientific and Cultural Organization (UNESCO) list seeks to encourage the identification, protection and preservation of cultural and natural heritage around the world considered to be of outstanding value to humanity – Zhangjiajie was selected for its lush vegetation, unique sandstone pillars, pristine waters and a wide variety of species of flora and fauna. Upon arrival, your guide will meet you at the airport and transfer you to your hotel, where you can rest up for the exciting days ahead. Visit the Yellow Stone Village (cable car up and down). Yellow Stone Village (Huangshizhai) has the largest summit platform in Zhangjiajie National Park, where there are numerous lookout points for stunning views, from which you can see nearly half the peaks of Zhangjiajie. There is a popular saying that says, “if you don’t visit Huangshizhai, you can’t claim you have come to Zhangjiajie.” You will also visit Six Wonders Pavilion, which stands on top of Yellow Stone Stronghold; it is the only cultural place of interest among the natural scenery — the “six wonders” refer to mountain, water, stone, cloud, plant, and animals. There are numerous other visual spots including Star Gathering Stage, etc. After lunch enjoy a leisurely stroll along the Golden Whip Stream (about 4.7 miles). We will follow the twisted road in the deep valley, packed with many nice places to stop and rest. Then transfer back to the hotel. Sightseeing in the Tianzi Mountain (cable car up). This area is known for 4 natural spectacles – the clouds of mist that circle the peaks of the mountain, the amazing views of the rising sun, the moonlit nights and snowcapped winter peaks. They include more than 80 natural platforms to take in the magnificent scenery. We will visit The Marshal Helong Park (where there is another terrace for panoramic views; the park is in commemoration of Marshal He Long of the Chinese People’s Liberation Army); the West Sea Stone Forests (where numerous peaks stand with different shapes and poses, covered with lush vegetation– therefore, it is called sea of trees and sea of peaks). Wulingyuan features some 3,000 towering sandstone pillars and peaks, 243 of which are more than 1,000 meters high and most are over 200 meters high. Of these, the Imperial Pen Peak, which we will see, is in excess of 100 meters above sea level, and has several parallel apexes of different heights. It is regarded as being the best representative of the peaks at Wulingyuan. We will then take a shuttle bus to Yuanjiajie for lunch. After lunch, sightseeing in Yuanjiajie (a naturally formed platform mountain, surrounded by higher summits which are divided by deep valleys) and then take the Bailong Elevator down the mountain. The Bailong Elevator is a glass elevator built onto the side of a huge cliff that is 1,070 feet (330 m) high. It is claimed to be the highest and heaviest outdoor elevator in the world. We will also see the First Bridge under the Sun which appeared in the film Avatar many times. Transfer back to the hotel. After breakfast, depart to Phoenix Ancient Town, an ancient town of historical and cultural significance. It is a township of mystery, elegance and primitive simplicity. The bridges over the water and unique houses built on stilts display a harmony that is so often portrayed in traditional Chinese paintings. Tuojiang River runs through the town. Typical high gabled wooden houses are built on stilts along its banks at close quarters. The majority of the residents are Tujia & Miao ethnic groups. Their lifestyle remains reasonably traditional and is a wonderful example of what villages were like prior to the onset of modernization. Here dozens of alleys paved with flagstones run between the houses, each showing wear caused by the feet of generations of local people. In the afternoon, visit South Great Wall (an excellent example of municipal fortification). Evening free at leisure walking along the ancient street to enjoy the local food and snack delicacies. Visit the Phoenix Ancient Town in the morning, especially the quaint covered Hongqiao Art Bridge (with small shops on it), East Gate Tower (originally called Shengheng Gate as one of the four town gates. It is close to the Tuo River and built in 1715), and the former residence of the great writer Shen Congwen (constructed over 100 years ago by Shen Congwen’s father when serving in the Qing imperial government; former residence of Xiong Xilin and the first prime minister of the Republic of China), and Yang’s family divine yard (the Yang family was the second largest family in the town. It is said that people with family name “Yang” are descendants of the famous patriotic Yang family in the Song Dynasty. Yang Ancestral Memorial is the best preserved temple in Ancient Phoenix City). Take a boat tour on Tuojiang River (the mother river of the ancient city of Fenghuang, which runs slowly along the city walls, nurturing the people of the city for generations) and enjoy the view of Miao-style tilted houses of the ancient city on both sides of the river. Return to Zhangjiajie in the afternoon. After dinner, transfer to the airport and depart Zhangjiajie to any optional city.